The founder of the modern Zionism and the visionary of the Jewish State spoke neither Hebrew or Yiddish, had no Jewish education, and was so thoroughly secular as to appear, in fin-de-siècle Paris and Vienna, the very image of a dashing boulevardier. Had not the Dreyfus Affair exposed Europe's dark underside of vicious antisemitism, Theodor Herzl would not have had, in bitter reaction, his vision of a publicly and legally secure home for the Jewish people. Nor, had he not proclaimed the same in his 1896 pamphlet entitled, "The Jewish State," would this unlikeliest of leaders ever have become, to a great many Jews, a modern Moses - and to a great many others, a nettlesome Don Quixote. Among the groups who opposed Herzl's nascent Zionist vision were, to various degrees, Reform Jews, in that a Jewish state compromised their nationalist loyalties as, say, good citizens of Germany or France or the U.S.A. The leftist General Jewish Labour Bund had no use for Zionism either: the establishment of a little Jewish state was merely a distraction to the greater issue of worldwide communist victory. And, as if it weren't enough to have solidly assimilated Jews and violently revolutionary Jews against Zionism, a great many Orthodox and Chassidic Jews were opposed to it too: those waiting for the Messiah to come and so establish Israel, looked with distrust upon the secular and non-religious Zionists attempting to do the same. But Herzl, writing this letter, had yet to see how divided the Jewish people were in relation to a Jewish homeland. His pamphlet had been out, after all, just three months, and everyone, he was urging, was welcome. Here he argues for the inclusion of the Chassidim in the new State wherein "everyone should serve God in his own way:"
I am in favor of absolute freedom of conscience. Everyone should believe in, or not believe in, whatever he wants. Stefan Zweig said that this moment in Herzl's life, "while the idea [of Israel] was still a dream of vague outline, was decidedly the happiest in Herzl's short life." Even the incredible disunity of the Jewish people - between the secular, the socialists, the ultra-Orthodox - seemed easily soluble then. Believing that "the faith of our fathers" would prove the common link between the traditionalist and impoverished Jews of Eastern Europe and the assimilated and cosmopolitan Jews of Western and Central Europe, Herzl was sure that the rabbis had a crucial role to play in the creation of the Jewish homeland - especially, as he noted here, those of Orthodoxy, which had so helped to preserve the Jewish people. But his next step had nothing to do with religion; to move forward, money and influence were now needed. The announcement, made near the end of this remarkable letter, that he would in a few weeks travel to London to "to establish the Society of Jews", was crucially significant in the development of the "national idea." 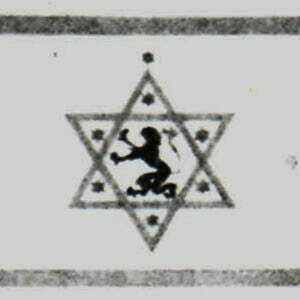 He had in mind, by a "Society of Jews", a kind of aristocratic Grand Council - such as had governed the republic of Venice - comprised of well-placed Jews who would generously help to create a Jewish state in Palestine. Hence in late June, he spoke to a group of Anglo-Jewish gentlemen - who, politely, begged off; the scheme, they felt, was fanciful. He went on to Paris, and spoke to Baron Edmond de Rothschild. He, impolitely, decried the notion; Herzl's plan, he scorned, would bring 150,000 beggars to Palestine. An elitist "Society of Jews", clearly, wouldn't work. What was needed, Herzl realized, was something else - something which would empower the Jewish masses. A Congress; a Zionist Congress - soon. On August 29, 1897, in the Basel Municipal Casino, Herzl's idea for a "Society of Jews" came forth as the First Zionist Congress - and after 2,000 years in the Diaspora, it proclaimed that the Jewish people were going home. Autograph Letter Signed, in German, 3 pages, octavo, on the letterhead of the Editorial Department of "New Free Press", May 4, 1896, Kolowratring, Fichtegasse Nr. 11., Vienna. To "Most Honored Sir!" I received your letter already a few days ago, but wanted always to wait with the reply, until I would have more time. Now, just the same, I must write to you in a rush. The agreement of [...] touches me deeply because I received it for my sincere [...]. I am in favor of absolute freedom of conscience. Everyone should believe in, or not believe in, whatever he wants. I know very well what gratitude Judaism owes to orthodoxy, because the latter, with its steadfastness, has contributed much to the preservation of Judaism. But allow me to hope that in our State, when we achieve it, there will not be any falling out on matters of faith among us Jews. Everyone should serve God in his own way. Within himself, he should be as free as he wishes and as he is able to be. when I transfer the leadership of Jewish matters to the Society.